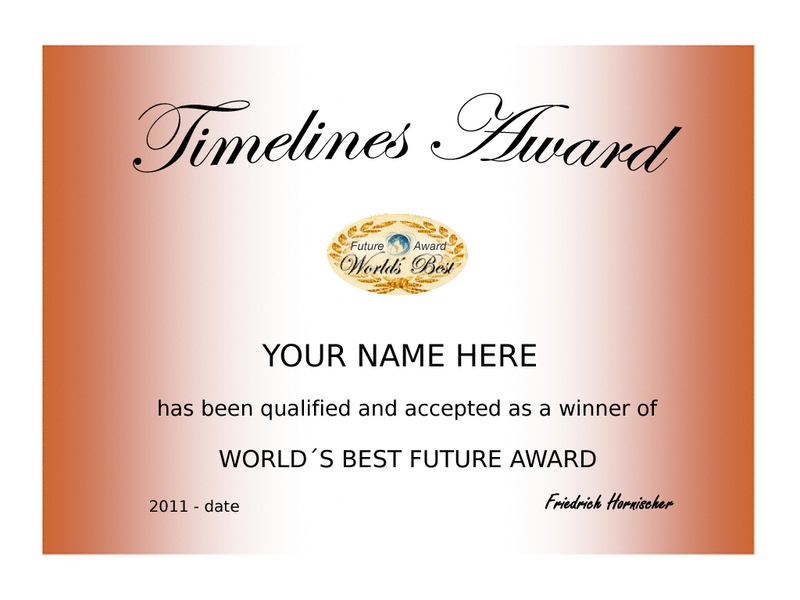 New in November 2011: New Award Graphics for 2012. World´s Best unifies with Future award, Gold award, Silver award, Bronze award and Soty award. The new designed awardgraphics show a laurel wreath and our planet earth. You can apply for this award or nominate a website. Please read the criteria before you make a nomination or apply. World's Best Award honors sites that show unique excellence in content, presentation, design and coding - Timelines' Top Award. All Awardgraphics are created by the awardmaster. In 2009 March I designed new graphics. They show a fantasy - arrangement of our future developments in genetics, nanotechnology and robotics. There is a future award instead of the innovative award. You are not allowed to alter the size of the graphic: 125 x 125 pixel or 100 x 100 pixel. New also in 2009: As a winner in addition to your awardgraphic for your website you will get a beautiful certificate 1024 x 768, with your personalized awardgraphic and your name on it, which you can print out on your computer. World´s Best Future Award honors sites that deal with future developments. Category 1 "Future Visions" awards sites showing future developments, visions, or is a vision itself. 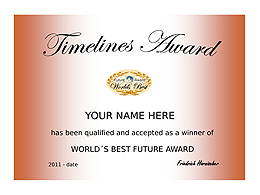 Category 2 "Future Content" awards websites showing a content that will keep its validity for a long time. Category 3 "Future Design" or "Future Art" awards websites showing a future design or art that will exist for many years.